How are social media pages performing in 2018? And what you can expect for 2019. Every time we as marketers and business owners think we have our social media marketing strategy figured out, a major algorithm change is announced or a new social tactic ends up becoming the latest trend. So here are some of the best insights our team has pulled together that you need to know. 1. The most engaging social media pages post more. The question of whether or not to post more results in more engagement and reach for your Instagram and Facebook Business Page has long been asked. Many businesses, brands, and marketers have reported a positive increase in results when they post more, while others have experienced quite the opposite. Either way, the statistics show the truth. 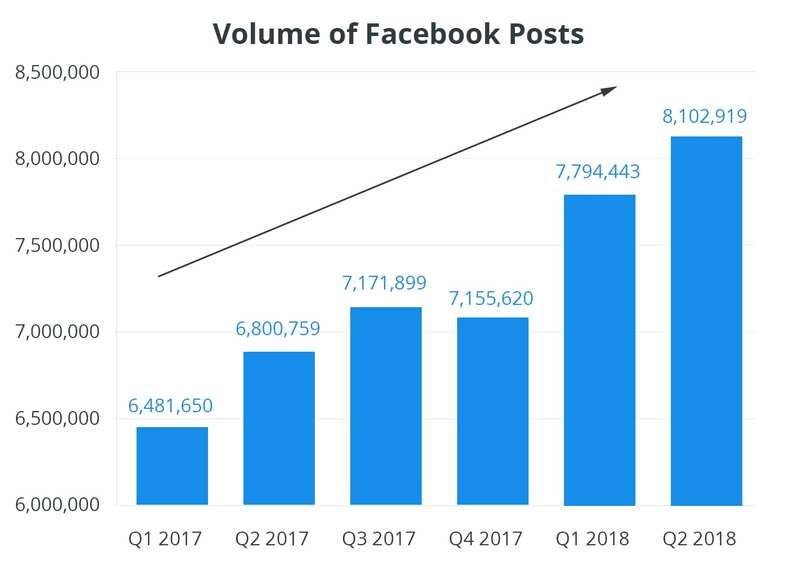 In fact, there has been a 24% increase in the number of posts per quarter from 6.5m posts to 8.1m posts just over the past year. That’s an increase from 72,000 posts per day in Q1 2017 to 90,032 posts per day in Q2 2018. Meaning, nearly 20,000 additional pieces of social media content are being posted by the world’s top brands… every single day. In Q2 2018, the top 20,000 Facebook pages were publishing an average of 135 posts per month. That is an average of 4 posts per day. 2. Overall page engagement is drastically dropping. Naturally, if the world’s top Facebook Pages are posting an additional 20,000 pieces of content per day to the platform. Then there’s going to be an increasing amount of competition in the News Feed and a decrease in engagement spread across the board. 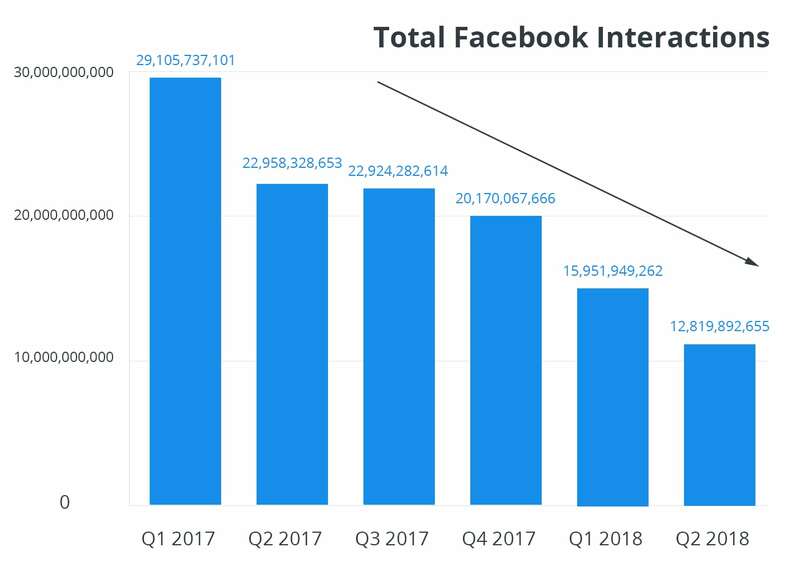 But for brands and businesses, I don't think you truly understand how dramatic this decline in engagement (shares, likes, reactions, and comments) has been overall. 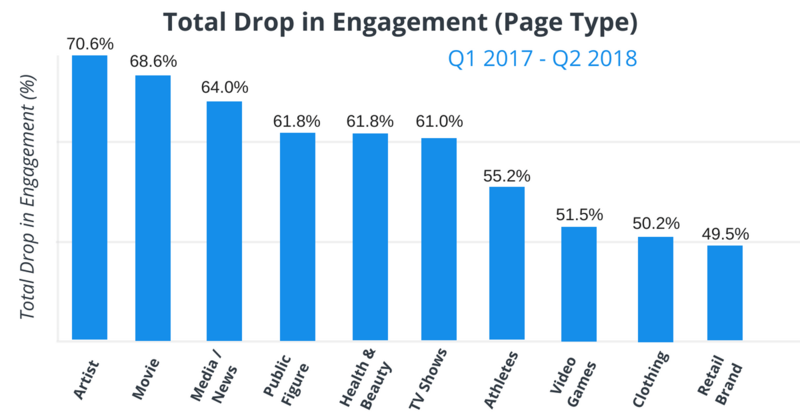 The fact is engagement has dropped over 50% in the past year. In that same time frame, the average engagement per post has dropped by over 65%. 3. Social engagement is down for video, images, and links. 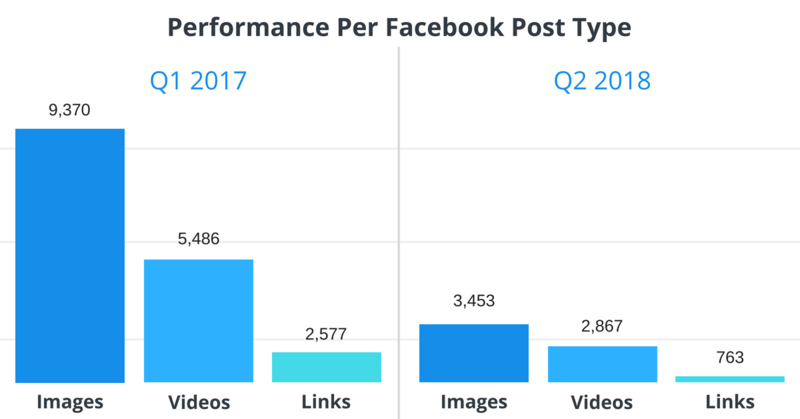 As with most social networks, the data shows that there is a difference in performance between the various types of content that are posted (links, videos, images) per page. But we are looking at the average across the board. In fact, if you truly want to know how your social media pages analytics are being affected I suggest you reach out to your marketer or agency for more info. Interestingly enough, despite video being the buzz for 2018 the stats show different images (not video) regularly receive the most engagements per post. However, to be consistent with the data above, average engagement per image dropped over 70% from Q1 to Q3. While for video fell just over 43% per post. Here is a chart showing the difference in performance per the post type. 4. Posting 5 times per day resulted in the highest engagement overall. Now there is going to be an optimal amount of posts to release depending on your brand or business. However, those that posted less than once per day had the lowest overall levels of engagement. But if you increased the frequency of posting the overall levels of engagement rise. Pages posting 5 times per day received a lower average per post but a higher total of page engagements. 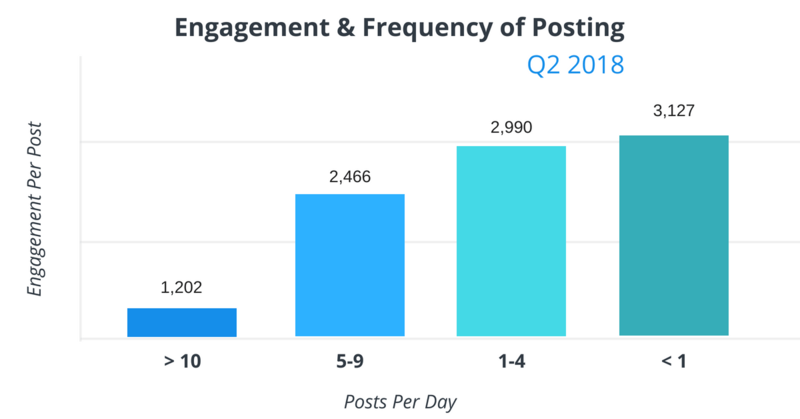 In other words, posting 5 times per day would appear to be the optimal Facebook posting frequency. 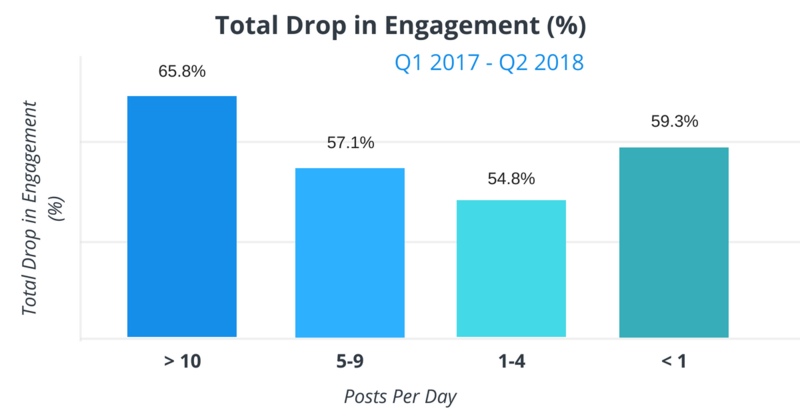 Engagement has fallen over the last 18 months regardless of posting frequency, all social media pages have suffered a 50% reduction in engagement. Those Facebook Business Pages that posted more than 10 times a day saw the biggest fall off in engagement by nearly 66%. 5. Top social media page categories experienced a 50%-69% drop. If your page is in one of these categories you can probably see why you might have seen a drop in engagement. Page categories still play a key role in the overall success of your Facebook marketing strategy. When selecting your Page category, be sure to understand the nuances between each and how it will affect your content. If you don't choose the right page type, post type, and release time. Then you can probably expect more than a great drop in engagement across your page. So it is important to make sure to speak with your marketer or agency on what your exact posting strategy and marketing strategy should be for social media. 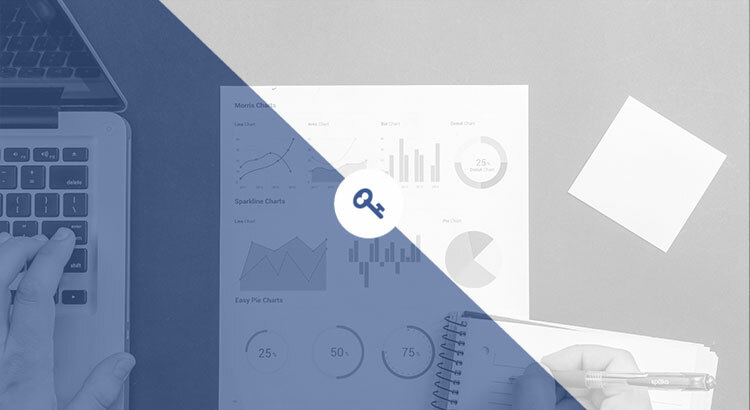 With 2019 around the corner it is going to important to pay attention to the data-driven social media world we now live in day-to-day. What is your social media posting strategy and is it effective for your brand or business?